18 1/4 (20 1/2, 22 3/4)" brim circumference. Hat shown measures 20 1/2". -Finished Sizes: 18 1/4 (20 1/2, 22 3/4)“ brim circumference. Hat shown measures 20 1/2”. -Yarn: S. Charles Collezione Ivy (100% cashmere; 125 yd 115 m/1 3/4 oz 50 g): #100121 taupe, 2 (2, 3) balls. -Needles: size 4 (3.5 mm): 16” circular (cir) and set of dpn. Adjust needle size if necessary to obtain the correct gauge. -Gauge: 21 sts and 34 rows = 4” in charted patt. 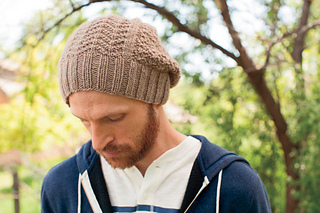 This men’s slouch style hat features a knit and purl pattern in the body and a comfortable ribbed brim.